Why study Quechua?-Imarayku Runashimita yachakuna? Quechua is an indigenous language from the Andes Mountains in South America that dates back to the Incan Empire! Participate in global history by actively engaging with an international movement to revitalize and further strengthen the indigenous language by learning Quechua with a humanizing approach that is rooted in social justice. Become a part of the international family, or AYLLU, by speaking Quechua that is now an official language of communication in Ecuador and is spoken by over 10 million people throughout North America and South America (encompassing what is today Perú, Ecuador, Bolivia, Colombia, Chile, and Argentina). Learn how to share your own narrative through fun and creative projects, such as: translation, writing poetry, analyzing music, filmmaking, gastronomy, campus events and through many more outlets to share your story! 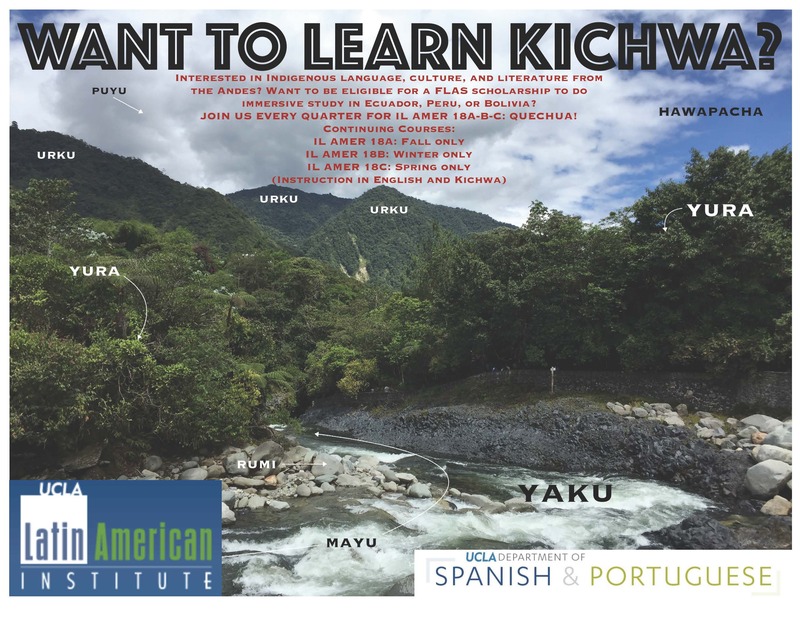 The Quechua/Kichwa program is an interdisciplinary course that once immersed, you will learn valuable knowledge about the indigenous Quechua/Kichwa culture through language acquisition. Having access to an enriched culture (with beautiful history, architectural masterpieces, vast knowledge about astronomy and medicine, and incredibly ingenious designs for resourceful agriculture practice) through speaking the language is a great way to experience and connect with a different world and reality. Learn how to say common greetings in Kichwa. Learn how to say the colors in Kichwa. “Ñuka Yawarmi” a poem by Quechua/Kichwa program alumni Rocio Flores. Subscribe to alumni Rocio Flores’s YouTube Quechua/Kichwa channel to learn more! Since 2009, professor Luz María De La Torre has been teaching all three levels (A,B,&C) of the course, “Indigenous Languages of the Americas 18 (ILA 18A, ILA 18B, and ILA 18C)-Elementary Quechua”. Professor De La Torre is Kichwa (Quechua) indigenous woman from Ecuador and she is an internationally renowned intellectual that is one of the leaders in promoting the Andean language and culture through her humanizing paradigm that allows students to fully engage in the classroom and seek knowledge about the indigenous culture far beyond the classroom. Her research has concentrated on the Indigenous Movement and its relation to the Ecuadorian government, specifically since the 1990s when the Indigenous National uprising took place. Currently, her research writing, and teaching focuses on topics related to the Andean Indigenous cosmovision, gender from the Andean perspective, Andean alternative economies and knowledge, and new political relations between the nation-state and indigenous peoples. Study Abroad in Tawantinsuyu!-Tawantinsuyupi yachakupay! Email Luz Maria de la Torre or achiqpacha@g.ucla.edu more for info. You can also follow us on Facebook.